During a game of chess, a player must constantly evaluate the positions arising on the board. As we have seen before, in order to do this correctly, one needs good positional understanding, as well as attacking skills. After deciding what type of play should be employed, typical chess patterns, such as weak pawns, weak squares, position of the kings, piece coordination, activity, development and so on come into consideration. Given that the material is even, these elements should help us determine the right evaluation of the position. However, many times we are faced with situations where imbalances can be created and we need to make a decision. It is probably safe to say that, from a theoretical point of view, every chess player knows the value of the pieces and if a trade is fair or not. For example, it is common knowledge that three pawns can be equal to a minor piece or that two minor pieces are usually better that a rook. While these “rules” might be true in most of the cases, there are always exceptions and, like always in chess, we need to take into consideration the positional factors present in our game. 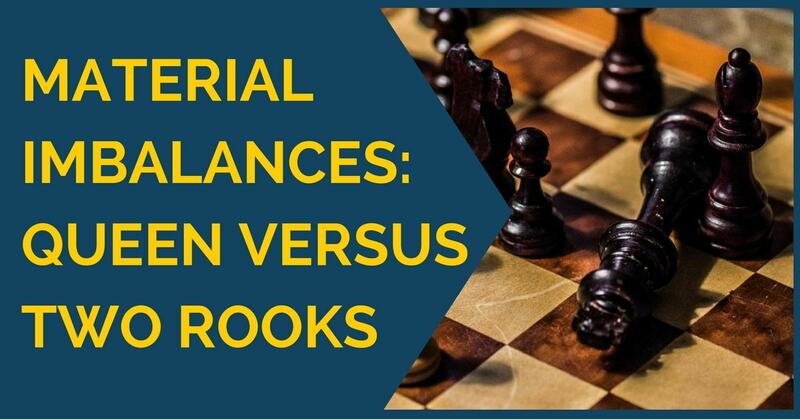 In this article we are going to talk about one material imbalance in particular, queen versus two rooks, and when one or the other represents an advantage. Piece activity. Of course, everything depends on the actual position here, but what we wanted to underline is that, in order for either of the pieces to be good, they need to be, above all, active. Here, white decided to complicate things and enter a position with two rooks versus queen where only he could play for a win. However, after the exchanges, black managed to liquidate the queenside, which made it impossible for white to win the game. The only difference from the previous game is that here white has doubled pawns on the g file. However, this little detail is crucial, since black won’t be able to use the perpetual check ideas that we saw before. Here, the activity of the two rooks makes them better than the queen, and, as we will see in the game, it is very difficult for black to keep everything protected. With correct play, black should be able to hold the position in the diagram above. However, with a more exposed king and worse structure, this is not an easy task. White managed to combine these two elements and went on to win the game.